What are they? How to make them? Artist Trading Cards are collectable cards that had its origin from sports-themed trading cards. They are usually referred to by its abbreviation "ATC". The one rule for making these artistic trading cards is its dimensions: They must be 2.5"x3.5" in size, or 64x89mm and should be made of sturdy cardstock. Free Template provided at the end of this article. 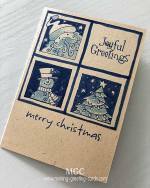 Artists and crafters all over the world make these art cards and trade them with one another at art conventions, craft fairs, online, etc. 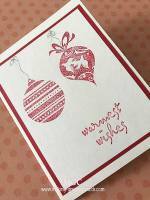 All media and techniques can be used on the cards; rubber stamping, collage arts, fabrics or any other media. ATC can be originals (one of a kind, editions (come in a set with numbers e.g.1/4, 2/4 and so on) or series (a set that has a theme but each card is different from the other). On the back of each card are the particulars of the artist - name, email address, title of ATC, ATC # if it's part of an edition. Usually, each card is encased in a transparent pocket or card sleeve for protection especially if they are to be sent through the post. 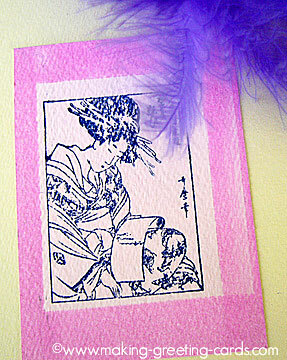 Here is a simple ATC that I had created using just one rubber stamp with a Japanese image. First, I used the ATC template to mask certain area. Then using a small ink pad, I created a frame for the rubber stamped image. 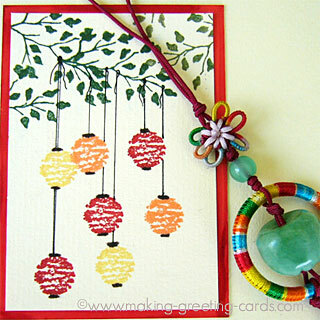 This is another Asian style ATC using rubber stamps to create the branches and Chinese lanterns. Some parts are hand-drawn in using markers and fine liner. 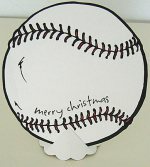 Then the card is layered over a 3.5" x 2.5" colored card. Another card that uses masking to create a frame. Here the ATC template is tilted before I rubbed ink over the four corners. 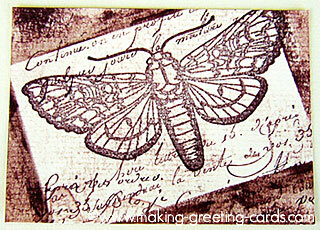 Then using the same ink, I stamped the moth image and the script. Using 3 complimentary colors, I created a background by rubbing my inked finger over the cardstock. 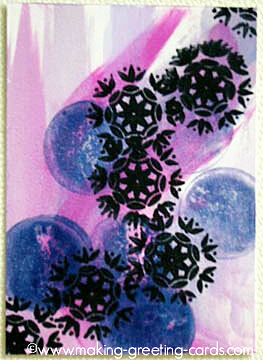 Then I inked the circle stamp and stamped randomly over the background. Finally, inked the rubber stamp with black ink and stamp. 2 files to be downloaded. 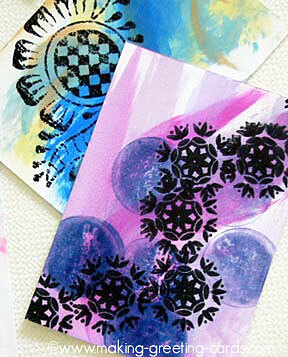 The first is the template and the second one is for the back of your ATC. Below is an image of the card's backs. When printing both the ATC templates and back Of ATC, remember to set Page Scaling to "None". You will need the latest copy of Adobe Reader to view and print these files. Photocopy onto a sheet of transparency. 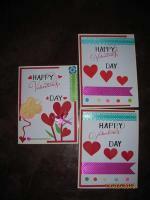 Place the templates on cardstock. Use a pencil to draw around it. For the envelope, just fold on the dotted line and glue on the seam and bottom flap leaving the top flap open for sliding in the Artist Trading Card. Remember to turn the ATC over and write your particulars. You can also create your particulars on Microsoft Word and print it out, then glue to the back of your Artist Trading Cards. That's it! Start trading and have fun!